In this case, that someone is Liz Hemond, who is a Ph.D. student at Northeastern University in Dr. Steve Vollmer's laboratory. Liz did her undergraduate work at Columbia University and a masters degree at UNC Wilmington on bay scallop population genetics. She is now continuing her East Coast tour ranging from Boston to Panama, and I'm delighted to have her guest blog today. 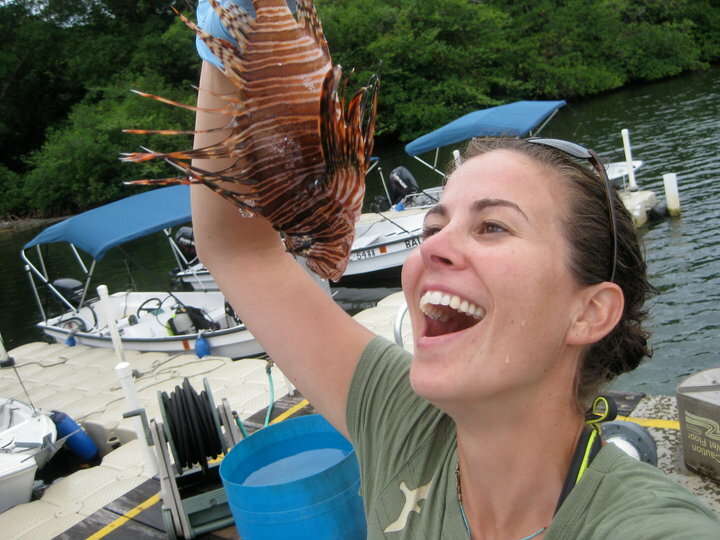 Liz Hemond, bravely capturing an invasive lionfish in Panama. I am lucky enough to have escaped from the brutal Boston winter (sorry fellow NEU grad students!) to the tropical paradise of Bocas del Toro, Panama, where we are based out of the Smithsonian Tropical Research Institute field station. While I assist with the coral biology and coral reef ecology courses offered by the Northeastern University Three Seas program, I also have the opportunity to start some of my own research, follow up on studies that my lab has been conducting for the past three years, and explore some new places around the archipelago. I am a PhD student in the lab of Steve Vollmer, and our group’s research focuses on the study system of white band disease in corals. The corals affected by this disease are the Caribbean Acroporid corals, staghorn coral (Acropora cervicornis) and elkhorn coral (A. palmata). These are major reef building corals throughout the Caribbean, but their populations have declined massively due to white band disease. Fortunately for our research, Bocas del Toro has impressive fields of beautiful staghorn corals, which manage to persist, despite the disease. Part of our research consists of simply monitoring the prevalence of the disease on staghorn corals, which appears to increase during the summer and decrease in the winter (aka the slightly less hot months). We also measure the rates at which the disease affects the colonies. The disease can kill a year’s worth of coral growth in 2 to 3 days. Beyond monitoring, our lab is trying to understand both what causes the disease and the response of the coral itself to the disease. Like many relationships, the relationship between corals and disease pathogens is complicated… Particularly complicated, however, because the coral animal contains photosynthesizing endosymbionts called symbiodinium (or zooxanthellae) and is also covered in a community of bacteria that may be either beneficial, or harmful, or neither. In the past few years, we have learned that some corals can resist white band disease, which could help these species survive to replenish populations that were previously decimated by the disease. The coral animal does have an immune system to combat the undesirable microbes, but how this works, and why some corals can fight off white band disease and others can’t is what our lab is investigating. I am an odd one in the lab, however, so aside from helping with the monitoring, my focus is not on white band disease. My research is trying to understand the genetic basis for how staghorn corals grow. Corals are very primitive animals, and most reef-building corals form colonies made up of asexually produced polyps. Acroporids are unique in that the polyps within their colonies have different functions, those at the tip of the branches (called apical polyps) are the site of rapid growth and calcification, while those farther down the branches (called radial polyps) contain the majority of the endosymbionts and are also the site of gamete production. The three seas students have been helping me set up an experiment to look at how these different regions of the colony function. Collecting fragments for a growth experiment with Three Seas student Felicia Aronson. Photo: Chris Marks. With my focus on staghorn corals, most of my time is spent at the same reef sites with my head in a patch of corals, but being on a coral reef, there is always so much more to see. Having a course with a group of almost 20 marine biology students is a great opportunity to check out new sites, different corals and learn more about the reefs in Bocas del Toro. The different reefs here, whether exposed or protected, close to or far from the extensive mangroves, have strikingly different communities and illustrate how different corals have very different habitat requirements. For example, to study our staghorn coral, the best sites are a 30 minute boat ride from the Smithsonian station. But if you study boulder corals such as Montastrea, lettuce corals, the Agaricias, or finger corals (Porites furcata) there are great sites just a five or ten minute ride away. This has to do with the water flow through and around the islands of Bocas del Toro, as well as the influence of the mangroves, Changuinola River and Canal, and human development, which all affect the quality of the water on the reefs. This past summer was unusually warm, and the reefs in Bocas were hit hard by a coral bleaching event. This January when we first arrived, I was surprised to see how much of the corals had bleached and remained bleached this many months afterward, particularly at the reefs between Isla Colon and the mainland. Besides the warm water in the late summer, the corals also suffered mortality due to a severely hypoxic layer that formed in the bay below 10 meters, which killed or bleached a lot of corals in the deeper water. 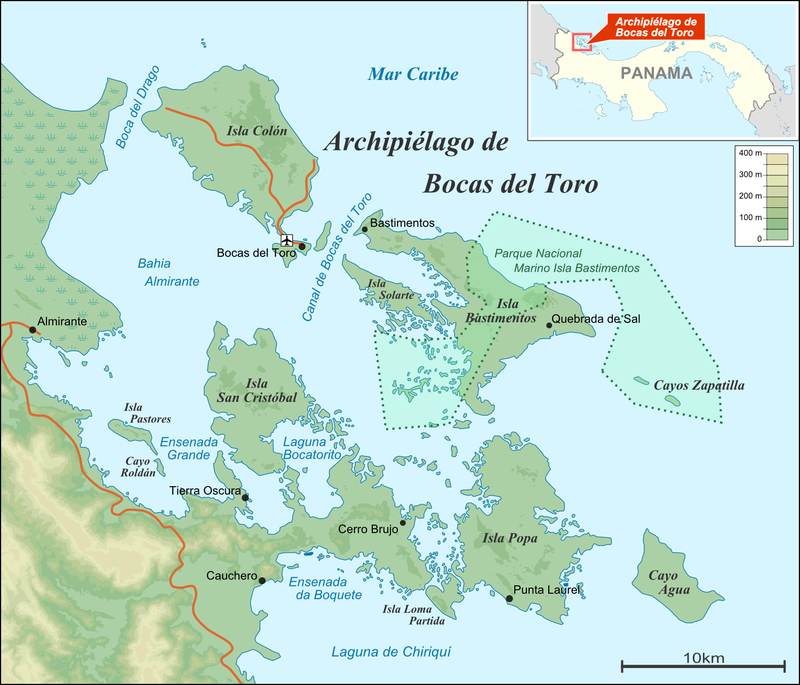 The health of the reefs in Bocas could also be heavily influenced by the large-scale agriculture, particularly the banana plantations that characterize the landscape of nearby Changuinola. We had the opportunity to take a boat ride up the Changuinola canal to see one of these plantations for ourselves. Given the scale of the plantations, and the prevalent pesticide and fertilizer use, it’s hard to imagine there they do not a large impact on the coral ecosystems here. However, we noticed a lot of cool critters manage to make their home in amongst the banana trees just fine. With so many places to explore in and out of the water in Bocas, I’m sure we will have no trouble filling our last five weeks here. Wow - fascinating. Thanks so much for sharing your perspective. Red Sea Expedition: How far do fish move?